Doctor Strange– former surgeon, Stephen Strange, is Marvel’s Sorcerer Supreme – the Master of the Mystic Arts. In the subway beneath Manhattan, a young girl’s harmonica is snatched from her by a heckler and she’s pushed into the path of an oncoming train. As Stephen Strange prepares to leap to her rescue, she begs of him to save the harmonica instead – he heeds her please, and grabs the instrument even though it means her very life. 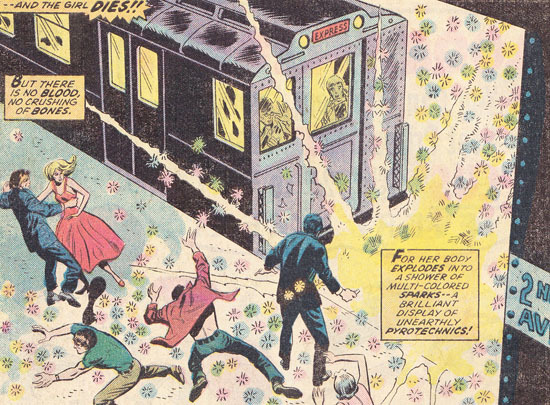 As the train collides with her body, she explodes into a dazzling light display – the multi-colored sparks seep into everyone there, including Strange and his beloved Clea. The two swiftly return to his Sanctum Sanctorum, where he hopes to unlock the mysteries of the harmonica with the name Celestia engraved on it. 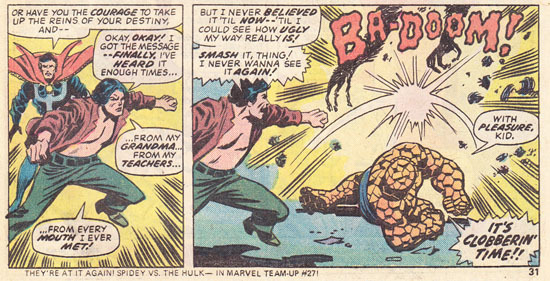 Later that night, the Thing gets a call from Mrs. Coogan from Yancy Street. She requests his help because her grandson, Duff, is acting peculiar (he was the one who pushed the girl at the station). And, since Ben remembers her being like a second mother, he responds quickly – meeting them at her third floor apartment. Meanwhile, Doctor Strange uses the Eye of Agamotto to discern the truth of the girl and the harmonica. It is revealed that the girl is a manifestation of Destiny. Each person in the subway has now affected their own destiny by the way they responded to her prersence. The mystery of the harmonica, however, remains. With this new knowledge, Doctor Strange decides that he needs to locate all the people that were in the subway, at that time, in order to redirect the courses of their lives so they are not destroyed. 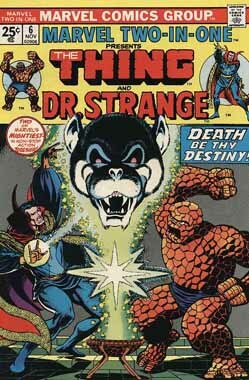 Eventually, Doctor Strange makes his way to Yancey Street where he discovers the Thing. After swapping stories, they discover they’re both investigating the same incident. 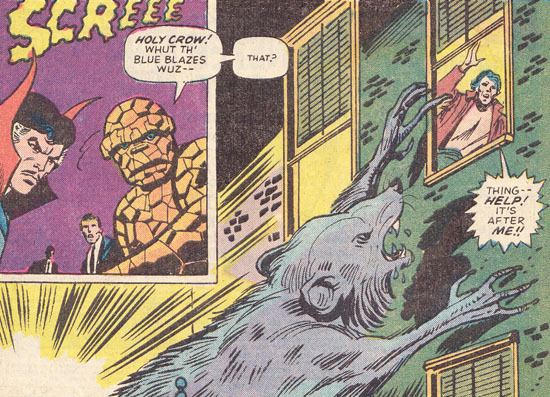 Fortunately for Duff Coogan, both heroes are in the vicinity when he’s attacked by a magically-created giant rat! The rat is a living symbol of Duff’s despair – he feels defeated by life. But, once Strange convinces the youth that he can control his life and eventually make his way out of the slum he lives in, the rat evaporates into nothingness. When Strange and the Thing return to the Sanctum Sanctorum to uncover the mystery of the harmonica, Clea reveals it’s gone! While they were fighting the giant rat, Valkyrie of the Defenders came by to take it – strangely enough, she claimed that Strange had sent her to get it. But, how could he have instructed her to do so when he was pre-occupied in Yancey Street? This adventures takes us around New York City from the subways beneath Manhattan’s lower East side to the Baxter Building in Midtown Manhattan. From Doctor Strange’s Sanctum Sanctorum in Greenwich Village to the Thing’s old neighborhood, Yancey Street. WHEN does the harmonica next appear? The mystery of the harmonica will be addressed in the very next issue of Marvel Two-In-One. WHY is Doctor Strange the guest-lead? That’s a good question! I don’t see any ulterior motive as to why Doctor Strange appeared in this issue – perhaps Gerber just really wanted to use the character. Gerber wasn’t writing the character’s main title at the time and although Doctor Strange’s solo title had just started in 1974, it wasn’t a new feature (he starred in Marvel Premiere until he proved popular enough to get his own title). This was a neat story that certainly played to the strengths of Doctor Strange’s mythos much more than it did the Thing’s. It was a thinly veiled attempt to inspire the reader to believe that, at any point, we can change the shape of our destiny. With a little positive thought, we can achieve great things with our lives. Fortunately, Gerber’s talent ensured that it didn’t come across as preachy and he also set up some interest for the very next issue – where the mystery of the harmonica is to be investigated further. Note: This issue’s letters column features commentary on Marvel Two-In-One #4. Additionally, this comic includes Marvel Value Stamp #47 (Green Goblin).